Stems: Erect, stout, usually arching, unbranched or sparsely branched above, white-woolly. Leaves: Opposite, simple, sessile or stalked, narrowly oblong to oblanceolate or spatulate, 1 to 5.5 inches long, .25 to 1 inch wide, broader at or below middle, silky or downy above, white-woolly below, occur mostly on lower 1/2 of stem; margins entire; tips pointed or blunt. Inflorescences: Spikes, 1/2 to 4 inches long, about 1/2 inch in diameter, resembling pinecones covered with white woolly hairs, terminal and often lateral on stalks. Flowers: Inconspicuous, sessile; subtended by membrane-like bract and 2 bractlets; calyces 5-lobed, lobes less than 1/12 inch long, white-woolly; petals absent. Fruits: Flask-shaped, 1-seeded, densely white-woolly; wings 2, lateral; seeds lens-shaped, rust-colored. Habitat: Dry, loose, sandy soils of prairies, roadsides, and stream valleys. Distribution: Principally central 1/3 and southwest corner of Kansas. 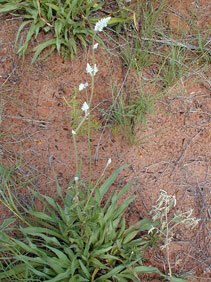 Forage Value: Field snake-cotton is poor forage for livestock but is consumed by deer. Comments: The inflorescence sometimes is used in dried floral arrangements.